Where Does Malware Come From? | How To Prevent Malware? With the number of internet users skyrocketing, there is a never-ending problem of malware infections originating from the internet. You visit a visually legitimate website, and suddenly a box appears informing you that your system got infected with a virus or Trojan. What would you do in this situation? You quickly close that webpage and start to scan your computer with antivirus software, which will eventually find nothing wrong in your computer. In such scenarios, the reality is that the malware wants you to believe that your machine is infected and you need to purchase the software to remove it. Once you have entered your credit card numbers and installed the software, the popup box goes away. Believe it or not, it's still there! You actually just infected your computer with a real piece of malicious software. The malware, in this case, is not harming your computer, it is the hackers trying to get you to install the real malware on your computer, and give them your credit card number too. There are many different ways by which malware infects your computer, some of the most common ways are listed below. Hackers use seemingly legitimate software and websites to lure users into downloading malware. The lure of free of free money or games entices some users. Even people who do not visit these shady sites are prone to enticing links being hidden on their computers. Malware that originates from these sites may travel around the internet and land on an innocent users computer redirecting their browsing experience to these sites. Peer to Peer (P2P) file-sharing networks is one of the most popular ways to share movies, games, music, and other files online. In a typical P2P network, participants make a portion of their own computing resources available to other network participants. In essence, file sharing over a P2P network allows computer users to share files directly from the computers of each other. P2P file sharing is also a very commonly used method for distributing malware and performing other malicious deeds. Trying to find a particular movie that is still in theaters? Maybe you want a free copy of the latest PC Game. Torrent sites are used by computer savvy users that have malware removal in their daily agenda. Keygens, Cracks, Serial Coders, all of these might be what you need but don't be surprised when you are infected. In most cases, the file you are downloading could be a rogue malware installer written by a savvy programmer. 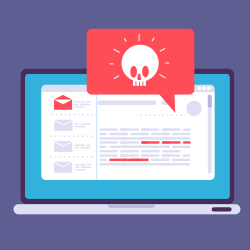 Email is the breeding ground for a many malware. If you open a phishing email that is sent with an attachment, it instantly collects information within your email, mainly your address book. It will immediately send similar phishing emails to all of the contacts in your address book, spreading the problem. When it comes to an organization, preventing malware attacks needs a completely different strategy. There may be multiple endpoints (computers, mobile device, tablets, etc.) to protect. For such scenarios, you need an endpoint protection solution that offers all-around protection. Comodo Advanced Endpoint Protection (AEP) is such a solution that offers complete protection across endpoints. Comodo AEP allows only known good files to run on a device with unlimited access, enabling users to run anything on their computer without fear of infection. Try Comodo Comodo Advanced Endpoint Protection today!